Bloubergstrand is a suburb of Cape Town, about 25km north of the city. The name is derived from the blue shade over Table Mountain when seen from Blouberg’s popular beach, and directly translates to “Blue Mountain Beach.” The area is both a popular tourist destination and a prestigious place to live in. The first people documented to live in Bloubergstrand were the Goringhaikonas. Their leader was “Harry die Strandloper,” also known as Hadah. Due to his diligence to the Dutch empire (the Verenigde Oostindische Compagnie), working as an interpreter between the indigenous people and the Europeans, he became the first postmaster in South Africa. The Dutch (under control of France) ruled the Cape until the early 1900’s, when the British forces invaded in order to occupy the Cape Colony. This colonial post was important to them as it was directly on their trade route. 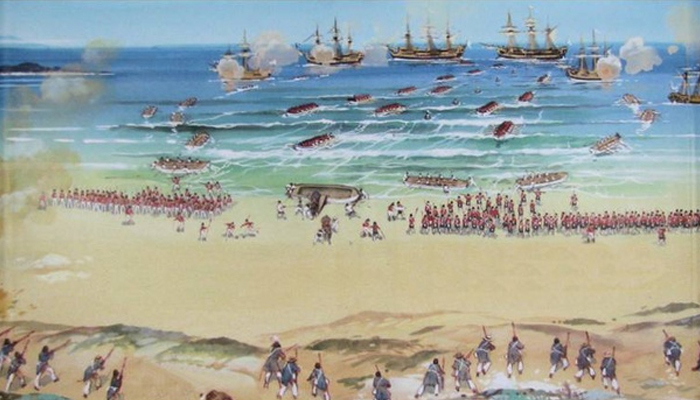 The Battle of Blaauwberg, which took place on 8 January 1806, is signified as the event that led to the British Empire becoming the new owners of South Africa. The British Empire occupied the Cape until 13 August 1814, when the Netherlands completely surrendered and the colony became the property of England. The battle began early in the morning with the exchanging of artillery fire from both sides. The Dutch forces battled with 2049 men, under leadership of General Janssens, and lost 353 to casualties, while the English side consisted of 5399 men who fought under leadership of Sir David Baird, of whom 212 lost their lives during the battle. On the 18th of January, the Netherlands agreed to capitulate, and the Dutch officials were all sent back home by March 1806. After the Battle of Blaauwberg, Frederick Louis Stadler became the owner of almost all the land that forms the area of Bloubergstrand. The famous monument, which operates as a restaurant in the area today, “Ons Huisie,” was the original farmhouse of said Frederick Louis Stadler. It is said this Frederick’s sons, Frikkie, Rozier, and Johannes are some of the original founders of Bloubergstrand as we know it today.